CWA Local 6327 proudly represents employees of AT&T Core; AT&T Mobility; YP Holdings and Cricket Wireless in the Greater Kansas City Metropolitan and surrounding areas, as well as the AT&T DirecTV Call Center in Tulsa, Oklahoma. Our goal is to ensure the well-being both on and off the job of each and every one of our members. In today's uncertain time, we are here to assist our members with labor issues as well as any other issues they may have. When negotiating with employers, there is power in numbers. Collectively we can achieve great things. Our members can expect a very engaged organization who looks out for their best interest and has a track record of positive results. For more information, please call us at (816)842-6327. CWA founding president, Joseph Beirne, called the triangle the “triple threat”. As the world around us continues to change it is important to stick to our roots and utilize the triangle model in order to defend the rights of members and their families.Click to add an engaging title. High quality images go a long way in looking professional online. CWA grows when we are actively involved in building our union. ORGANIZING is the key to increase the power of our union. With the continual decline of unionized workers it is now more important than ever to stand together for justice in the work place. Organizing existing and new member increases the strength of our members and makes it necessary for management and Legislators to hear our voices. MOVEMENT BUILDING is essential to maintaining the public’s support for our legislative goals, job security, standard of living and a fundamental right to organize. We also increase our political power by building coalitions for better legislation with other labor organizations and also with community-based groups who share a similar outlook. This program is particularly important in the current political climate, where Legislators prioritize capital before labor. 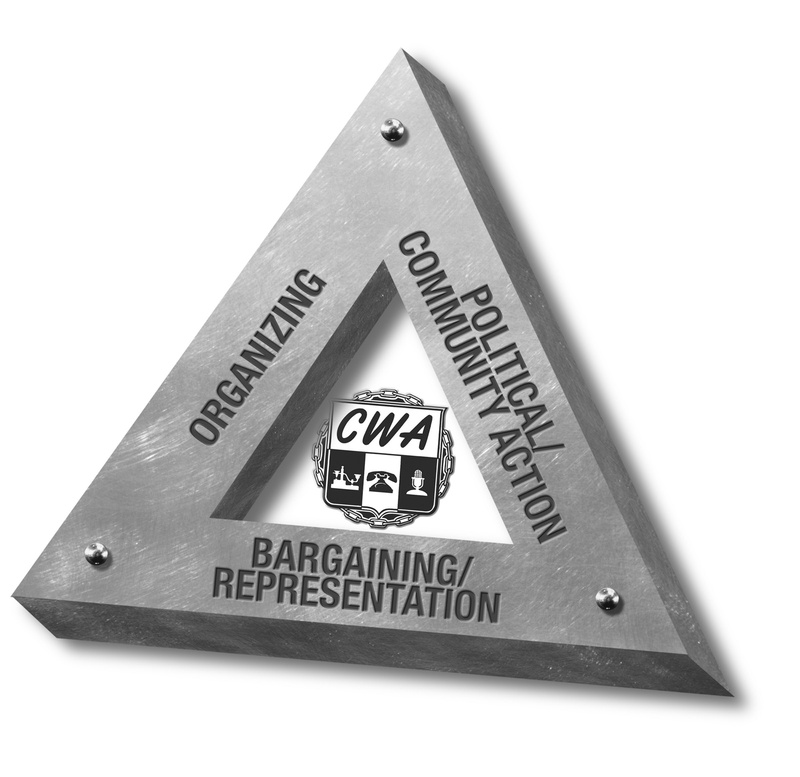 The base of CWA triangle is REPRESENTATION. Many join the union solely for better representation on the job. In fact, this is the primary purpose of the union and remains the base of our triangle. Effective representation depends on our ability to increase CWA’s power through organizing and effective community and political action.